Seniors played Moneymore in Moneymore on 15/06/08. St Martins, playing with the wind started brightly with Donal picking off a point in the first minute. By the 5th Moneymore had leveled from play but from there till the 22nd minute it was all one way with St Martins taking control of the game. Donal pointed 2 frees (6 and 10th min) with Barry following up with another free in the 13th min. Moneymore conevrted 1 of 2 chances to leave the scores 2 points to 4. Barry picked off another point in the 26th min and Donal converted a free 2 minutes later to leave the half time score 2 points to 6. With Moneymore converting 2 of their 3 chances St Martins were to rue their 8 wides. The second half started with Moneymore in a more positive attitude while St Martins had replaced Aidy with Paul McGovern at the top of the right. Out of 3 scoring chances within the first 5 minutes Moneymore converted 1 free. Donal converted a free in the 9th min for it to ne cancelled out 1 minute later with a free for the home side. On the 11th min Mickey McCann came on for Johnny and within 7 minutes he was on the score board. The kickout was won by Moneymore and they powered forward worked the ball into the net for a 3 pointer. This left 1 between the teams and everything to play for. Within the next 2 minutes the sides swapped wides. On the 24th minute Barrys free rebounded off the upright and Enda responded to sink the ball past the keeper and put 4 between them again. Moneymore responded with a point in each of the next 3 minutes to once more leave 1 point between them. Donal Murray worked the ball up the left wing and spotted Enda peeling off his marker. With the goal at his mercy Enda went for safety and blasted the ball over the bar. With only 1 minute of ordinary time we were 2 points ahead. Then came the type of injustice St Martins have been incurring this year. Moneymore in their attack worked the ball wide as was given by the umpires but the ref played on and Moneymore took advantage and slotted the ball past Chris into the net leaving them 1 point ahead. 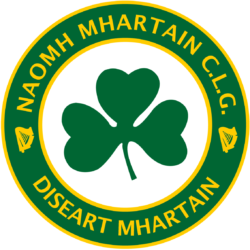 In an effort to balance things the man in black then gave St Martins a free in the 13 yd line which Donal converted to level the scores. 2,7 to 1,10. Chris Bradley, Connor Monaghan, Paddy McCann, Brian McElhennon, Eoin Hegarty, Paddy Kidd, Greg McGovern,Mark Madden, Jimmy McElhennon, Johny Trainor, Rory Murray, Donal Murray, Enda McGuckin, Barry McEldowney, Aidy McGuigan. With half the league gone St Martins have 5 points and other than a blip against Greenlough they have not been beaten by more than 2 points. These results will have to be improved in the second half starting with Faughanvale on Sunday to ensure safety in the league and with only 5 points between ourselves and the league leaders anything is possible.